PARKERSBURG — A nonprofit Parkersburg organization is making a difference in the lives of people with disabilities while benefiting the environment at the same time. The Jackson County Developmental Center (JCDC) embarked on a partnership with RightCycle, a recycling program for non-hazardous lab, cleanroom and industrial waste, by Kimberly-Clark Professional to provide employment for people who have survived traumatic brain injuries or have been diagnosed with autism spectrum disorders, learning disabilities and other conditions. The recycling facility is located in Millwood, W.Va.
Sara Rose, development and communications specialist for JCDC, said the mission of the JCDC is to provide quality support for life training and employment opportunities for people with disabilities. “Since 1979, JCDC’s purpose has been to assist people with disabilities with support in their lives and in employment. JCDC helps people find, obtain and retain jobs in their communities,” said Rose. According to Rose, the partnership is providing employment to around 12 employees with disabilities, and is working to expand that number. “Our biggest struggle is finding transportation for our employees with disabilities,” said Rose. Rose said they are always looking for opportunities to expand their work, especially when it involves helping others who may be overlooked by other businesses find work within their communities. “Oftentimes people with disabilities are treated as if they can’t work,” said Rose. “The RightCycle Program provides them with a job and a very clear task. It’s adaptable for lots of different ability levels — whether it’s removing a snap or zipper or processing the whole garment,” she said. 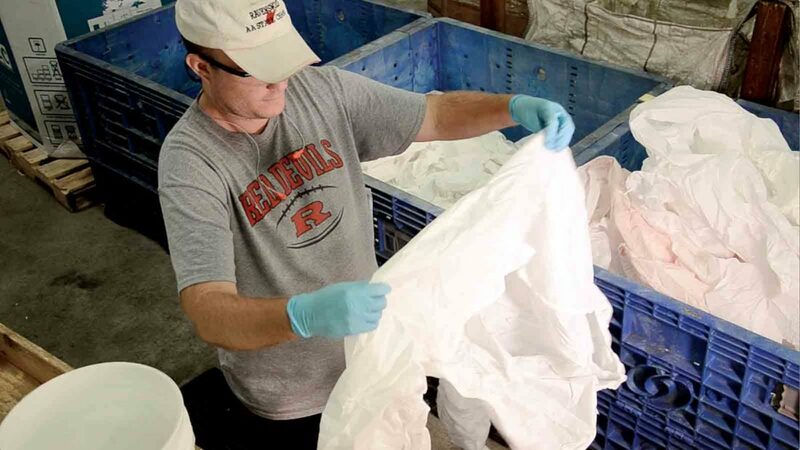 The RightCycle Program diverts previously hard-to-recycle items, such as single-use garments and gloves, from the waste stream and turns them into new consumer goods such as shelving, totes, lawn and garden furniture. The JCDC employees remove zippers and other nonrecyclable materials, so the item can be recycled. Since its launch in 2011, the program has diverted more than 660 tons of waste from landfills, officials said. “He’s been named employee of the year three times,” said Mark Crockett, JCDC production manager. “He works hard here. He bales. He counts. He weighs the bales. It just shows that with some patience, understanding and a willingness to let people show you what they can do, they can do anything,” Crockett said. It’s a ripple effect that is felt well beyond the JCDC production floor. JCDC works to educate the community about the importance of inclusion and giving everyone a chance to participate in work and social activities. Families know that their loved ones are in a safe environment during the day. And employees without disabilities form friendships with people they might not otherwise get to know, officials said. “From the young woman working side-by-side with people with significant disabilities to the older gentleman who had previously been institutionalized and unable to contribute to society, the RightCycle Program adds value to a wide variety of lives,” Rose said. “People with disabilities are not defined by their disability. They’re defined by the same things the rest of us are. When you think about the big picture, we all want to have purpose. And I can’t think of a better purpose than giving someone the opportunity to find theirs,” Rose said.